We provide weekly support to nearly 100 people with aphasia with approximately 2/3rds attending our Leatherhead groups and the remainder attending our Kingston groups. Despite many of our Members residing within Surrey and South London, we are fortunate to not be fixed by any geographical catchment restrictions so welcome Members from neighbouring counties. Our members are adults who have acquired aphasia at some stage in their lives. Many are still of working age and several have young families. The majority of our members have had strokes, some within the past 12 months, others several years ago. Some have mild aphasia, whereas others are unable to use speech all. Physical disabilities vary too. 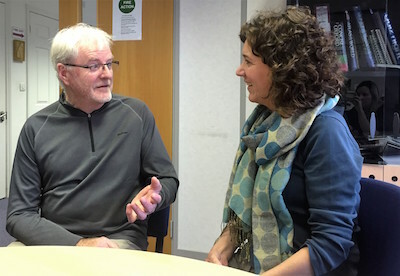 At Dyscover we help people with Primary Progressive aphasia (PPA) through our Couples Course, combining information giving and learning startegies to manage conversation, and peer support. Click here for more information on our course. Some members have been coming regularly to our sessions for over ten years. Others need our support for a shorter time. We review our members regularly to ensure they are continuing to benefit from the group they attend, and suggest changes if we feel it is appropriate. Listen to Bryan and Rosemary talking about the impact of aphasia and how Dyscover helps.